On three acres of “rolling hills and countryside” in the bucolic Western Jersey mining town of Sparta, MOHAWK HOUSE opened around 2004 after three years of construction. An exquisitely detailed and designed stone manor just off Route 94, this multifarious estate features several elegant wood furnished dining spaces, a roomy beer-centric bar, an expansive back patio (with hearth, grill and six-draught bar) and second-floor banquet space. 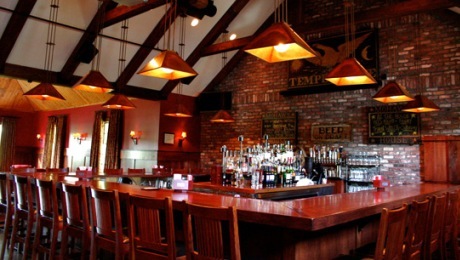 The cavernous red-bricked barroom offers an impressively broad U-shaped, 30-seat bar with decorative Edison light fixtures, bronze Temperance Eagle mural and back-windowed private room overlooking the glorious hillside. A temperature-controlled wine refinery sits across a top-to-bottom fireplace at the capacious right side dining room. The second-floor loft houses a conservatory, library with gas-powered hearth and back study. Steve Scro, Mohawk House’s owner, enjoys Old World antiques and serving locally grown “farm to fork” upscale cuisine at his Bed & Breakfast-styled sanctuary. A host of cellar-aged bottled beer and great spirits are available alongside 50-plus local-to-national draught selections. I had visited Mohawk House for a few beer-related events in the past. On this March 2018 mid-afternoon journey, I quaffed five previously untried brews, including three stouts (Green Flash Cacow Milk Stout, Flying Dog Sweet & Smoky Stout and Dark City Urban Decay Imperial Stout) , one porter (Kentucky Bourbon Barrel Blackberry Porter) and a fruity hybrid (Angry Erik Table 19 Infused Peach Tea). All are reviewed fully in Beer Index. Just off Times Square in Manhattan’s Midtown West Garment District, lively library-like prohibition-styled pub, DISTRICT TAP HOUSE, retains its olden vibe with antique wood furnishings and wall panels. But the real draw is the double-decked 50-plus draught system that serves well-selected brews alongside a fabulous culinary-designed food menu. District Tap’s elongated 30-seat bar features 4 TV’s, doom lights, colorful displays and hand-picked liquors. A few private backrooms offer elegance, comfort and quietude while right side dining tables fill out the tidy mid-sized beer parlor. One artful blackboard boasts “Drink The Boroughs,” a righteous slogan reinforced by a large contingent of fine local brews on draught. During my initial March ’18 visit, I discovered four previously untried beers, including NYC’s Five Boroughs Class of 2017 Pale Ale and Iconyc Dropping Bombs IPA, Cleveland’s Platform Speed Merchant White IPA and Illinois’ Destihl Moon Jumper Nitro Milk Stout (reviewed fully in Beer Index). A low key urban tavern with a positive vibe and highly respectable draught beer selection in Manhattan’s Hell’s Kitchen, VALHALLA features 48 tap handles at its popular 9th Street venue. A small wood furnished corner pub with rustic furnishings, it’s ultimately a diminutive Norse-themed establishment dedicated to Valkyries, the mythological queen who led dead Viking souls into heavenly Valhalla. Opened in 2006, its Kwaktoberfest banner hangs prominently from the low ceiling. Top shelf liquor is tightly packed into small space next to the draughts at the 20-seat left side bar. and 40 well-chosen bottled-canned beers are also available. Two corner TV’s and a few dining tables take up Valhalla’s chill-out dive bar interior. A small pub food menu offers beer-battered pickles, hot dogs, bratwurst, sliders, nachos and spinach artichoke dip. I discovered six previously untried brews on my initial March ’18 visit during a cool Saturday afternoon in NYC. Bunker Salad Daze Pale Lager, Staten Island Flagship American Wit, Wartega Spiced Ale, Pipeworks Passionfruit Guppy IPA, Pipeworks Rye Caramba and Montauk Double IPA were enjoyed and are fully reviewed in the Beer index. A cozy li’l hole in the wall with an unpretentious low-key vibe, terric 500-plus bottled-canned selection and fine rotational draughts, midtown Manhattan’s diminutive BEER CULTURE is reminiscent of a Speakeasy with its dimly-lit hideout setting, maroon-curtained front windows, antique Edison lighting and wood-floored rusticity. Buried in the middle of 45th Street, an orange-lettered banner leads Theatre District patrons into this tiny pub. At the left, its red brick-walled bar features 12 stools, two TVs and twelve tap handles across from a few wood tables and a refrigerator loaded with great local New York brews as well as trusty national brands. In the rear, the small kitchen serves light pub fare and a second refrigerator provides splendid international beer fare. A decorative Allagash barrel separates the front the back. While visiting on a Sunday afternoon, March, 2018 (following Broadway’s ageless Wicked), sampled tidy Iconyc Manhattanhenge Amber (reviewed in Beer Index) while wife downed previously quaffed Empire White Aphro Witbier. Inside an inconspicuous Route 32 mini-mall just off Route 287 one mile north of Woodbury Commons at Central Valley, A BETTER PLACE BAR & GRILL began operations in the summer of ’16. Serving a quaint neighborhood, this cozy sportsbar (with strategically placed TV’s) utilizes its 12 tap handles for mostly hand-crafted New York State brews. A wood-furnished pub with backside open kitchen and left side dining area straddling the 20-seat bar that snakes around the right side on a crazy angle, A Better Place feels homey and warm. An American flag carved from wood sits atop the tap handles and liquor bottles. On a seasonally warm pre-Thanksgiving Day perusal, fine Big Apple draught selections from Kingston-based Keegan Ales, Livingston Manor’s Catskill Brewery, Florida’s Glenmere Brewing, Chester’s Rushing Duck Brewing and Calverton’s Twin Fork get imbibed by the small mid-afternoon crowd. At the crossroads of Orange and Rockland counties heading north to the bucolic Upper New York expanse, A Better Place is its area’s best craft beer choice. In the center of St. Mark’s Place in Manhattan’s East Village, the fourth Barcade franchise opened during 2015. Taking the space once occupied by iconic New York record shop, Kim’s Underground, Paul Kermezian’s latest arcade-laden beer pub provides the same fine craft beer and wine as its other idiosyncratic locations. Retaining the crudely rustic black-walled interior and exposed pipes of its predecessor, Lower East Side’s Barcade features 20-plus taps at its right side 12-seat lamp-lit bar. A central blackboard lists current beer selections. On my terse half-hour stopover, October ’17, I discovered Great South Bay Splashing Pumpkin (reviewed in Beer Index). On deck were a few brews I hadn’t yet tried, such as Barrier Tanto, Shmaltz Hannukah in July in Napa, Du Claw Collusion, Chelsea Pumpkin Pie and Kelso Berliner Weisse with Cranberry. A dinky l’il hole in the wall tucked into the main thoroughfare of Sloatsburg’s Orange Turnpike, the diminutive SEVEN LAKES STATION is a fertile craft beer oasis specializes in local New York brews as well as fine Belgian ales and specialty one-offs. Open during the summer of 2016, its casual 8-seat bar (with 14 taps, a blackboard menu and walled TV) gets squeezed in next to three windowed tables. And the friendly low-key atmosphere, diminutive size and quaint ambiance contrast the loud biker-family sportsbar expanse of nearby Rhodes North Tavern and Characters Bar. Charming newlyweds Martijn Mollet and Jamie Lovelace make amiable hosts and there love for music and brews proves worthy. There’s even a nifty orange Dogfish Head Brewing turntable on a shelf. By August ’17, the beer-centric couple fixed up a three-tabled backroom (with chevron-patterned wood design, geometric bear and owl plaques and blackboard tap list) as well as a fenced-in picnic area (with Edison bulb lighting, patio furniture and graveled ground). Today’s previously untried fare included Beau’s Buenos Dias Gruit, an ancient Margarita-like herbed ale with lightly salted lime-peeled lemon juicing, and Oxbow Grizacca Saison, a dry-hopped saison with zesty lemon and orange tartness topping musty mineral grains. For dessert, I quaff long-time fave, St. Bernardus 12, a world class Belgian Abbey Ale with sweet-spiced candied fig, sugared molasses and toffee illusions. Well-suited for the pastoral quietude of nearby Harriman State Park (a historic spot for cutting class during high school), Seven Lakes Station proves less can be more. Besides the fine draught menu, there’s a refrigerator off to the side offering magnificent Belgian bottled beers and respectable local fare. Plus, warm pretzels, cheese plates and cure meats are available for munching. Right on the corner of Bleecker and Jones Street in Manhattan’s West Village, BLIND TIGER ALE HOUSE has been a New York City staple since opening in 1996. A legendary downtown pub, Blind Tiger emulates Prohibition Era Speakeasy’s with its comforting Olde World ambience and roughhewn wood décor. A rustic one-room fortress with old creaky floorboards, mid-walled brick hearth, farmhouse-styled ceiling beams and wraparound 18-seat bar, Blind Tiger’s multiple blackboards list 28 draughts plus three casks and several bottled-canned beers. Industrial lamps light the bar while several tightly packed tables and one hanging TV take up the rest of its cozy space. A light food menu includes sandwiches, appetizers and salads to alongside well-selected craft brews, wine and cocktails. On a hot September afternoon following the San Gennaro Fest, my wife and I grab a few stools to consume California’s Firestone Walker Helldorado Blonde Barleywine, Ireland’s Lough Gill Imperial Coconut Toasted Porter and Maine’s Allagash White (reviewed fully in Beer Index). Inside a small freestanding building previously used as a bank, COASTAL CRAFT BEVERAGE CO. popped up, August ’17, and serves as the first true beer pub in the North Carolina seaport town of Calabash. Owned by former draught system technician-installer, Paul Engstrom, and his friendly fiancé, Beth Hutchins, this detailed boutique operation has already drawn many curious local customers and a host of beer-centric vacationers with its fine hand-selected bottled and canned selection (loaded with hard-to-find and rare local brews). The gray-floored interior includes several refrigerators and shelves full of takeout offerings, several windowed seats, four tables and a turntable spinning Janis Joplin this Friday eve. On my initial visit during Coastal Craft’s soft opening, I head to the wood-paneled serving station and grab a few previously untried beers. Alongside family dog, Roscoe, and wife, Karen, we head to the four-benched side patio (with beautiful flower-columned trellises) to consume enjoyable Lynnwood Grill ‘s Helluva Hefe and Kiss My Irish Stout as well as Four Saints Triad Alliance Tripel (all reviewed in Beer Index). Brunswick County’s craft beer movement has just begun. Down the street, across the South Carolina border, Lowe’s Foods now has a Beer Den with 10-plus tap handles and fair local bottled-canned selections. And a few miles north, Southport’s Check Six Brewing became Brunswick’s first brewpub. Open since 2014, Myrtle Beach craft beer haven, THE GRUMPY MONK, features some of Carolina’s best suds. Set beside Route 501 a few miles west of the beach, this copious freestanding restaurant highlights the surrounding mall-bound highway shops. Grumpy Monk’s tall red-bricked entrance leads to a spacious right side sportsbar (with pristine granite-topped wood counter, brown fluorescent ceiling scape, multiple tap handles, various beer signs, several TV’s and sidled seating). Refreshing water-bubbled glass tanks separate the bar from the main left side dining area. Specialty cocktails along with shareable soup, salad, sandwiches, sushi and burgers fill the menu while beer lovers will be delighted by the ever-changing draught selections. My wife and I grab a few chairs underneath the partially covered front patio deck (with 25 tables) to consume seven previously untried brews with Hot Grandma (fried green tomato, Swiss-chedder cheese, bacon and aioli spice) during initial August ’17 lunchtime break. Alongside South Carolinian faves such as River Rat Blueberry Lemon Wheat, Frothy Beard Watermelon Wheat, Coast HopArt IPA and Low Tide Reese’Ding Brown Ale were New York’s Three Heads Too Kind Double IPA, San Francisco’s Anchor Mango Wheat and North Carolina’s Check Six Dugan Stout (reviewed fully in Beer Index). Arguably Myrtle Beach’s best beer bar, Grumpy Monk will surely not disappoint. With over 150 locations nationwide, the MELLOW MUSHROOM franchise began in Atlanta, Georgia during 1974. Bringing a family-friendly Alice In Wonderland-like atmosphere to a fun sportsbar, the zany restaurant chain specializes in stone-baked Southern pizza and drapes each of its franchises with eclectic art-fueled designs. At the North Myrtle Beach location on Route 17 (visited August ’17) conglomerated car parts form a crazy mesh at the extravagant entranceway. The colorful dining room sports several mushroom-affixed fishtanks, a private kids party room, a round-seated Boat section and sundry other delightful items. The yellow wood paneled left side pub area features a large centralized bar with 50-plus taps and various liquors. My wife and I sat at the covered side deck, where eight broad iron tables and seats serve outside patrons getting their last glimpse of today’s sunlight. During our one-hour dinner stopover, quaffed North Charleston’s Holy City Pluff Mud Porter and Asheville’s Wicked Weed Lunatic Blonde (reviewed in Beer Index) while chowing down Bruschetta and Kosmic Karma (red-sauced pizza with a pesto swirl, sun-dried tomatos, spinach and feta-mozzarella cheese). One of the most popular Portsmouth gastropubs, the generically-named BIER GARDEN offers authentic German and European food plus 25-plus taps and hundreds of craft beer bottles (listed in an intense cardboard notebook). Right in the heart of Olde Towne’s High Street just a few blocks from the Chesapeake Bay, this family-owned Bavarian restaurant opened during 1997 and quickly developed a loyal fan base. A trellis-flowered front deck just down from the entryway patio leads to an open-air dining space sidling a covered outdoor deck and exquisite left side dining area. The home-styled Bier Garden’s red brick foundation, bright blue window trimming and ever-present green plants immediately capture the eye. An aged-in-the-wool accordionist plays Oktoberfest oom pah music as well as polka and Italian ballads for outside diners. My wife and I chow down on vegetarian-styled Kase Spatzle (a German-noodled, Havarti-cheesed, onion-fried dish) and Jagerschnitzel (mushroom gravy-sauced pork-loin) this gorgeous Saturday afternoon, August ’17. Since I’d already tried every German draught available today, I imbibe one terrific Kentucky ale – Goodwood Bourbon Barrel Stout (a creamily oak-toasted full body with dark-roast chocolate and silken vanilla sweetness fully reviewed in Beer Index). All journeying beer lovers will enjoy this unique Bavarian-flavored destination. THOMAS CREEK CLASS 5 I.P.A.